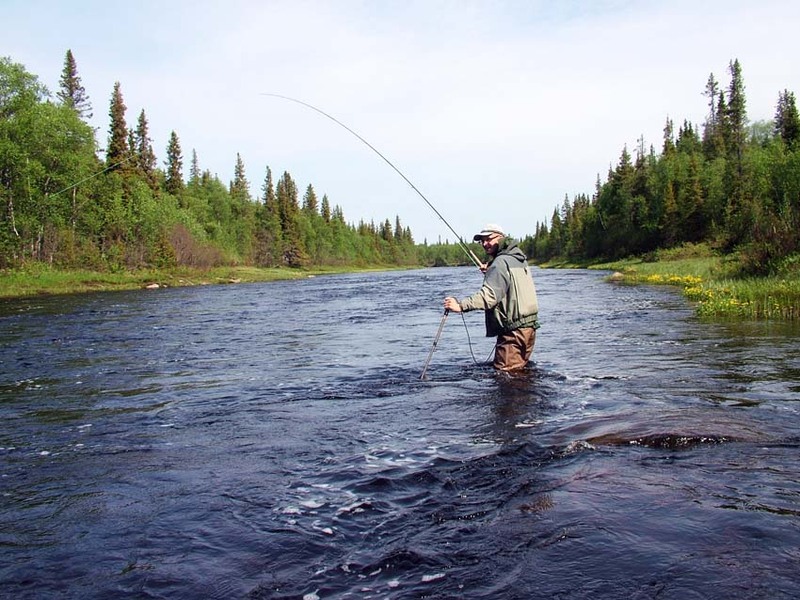 Spring salmon fishing on the rivers of Kola Peninsula. Salmon season on rivers Chavanga, Strelna and Varzuga begins in May. This period is characterized by high water levels in rivers, cold water and big quantity of fish. With the increase of water temperature of 6-8 C salmon becomes active and reacts to artificial flies. Therefore, for many anglers last May - first June weeks are the best start to the season. Fishing at the very deep places , large depth, big volume of the water, the main stream, under rapids holes , deep plum. Colors are mostly bright, contrast, in the wing of a combination of red, yellow, black with bright elements on the body flies. Fishing near the bottom, sinking line and flies 0.75-1.5 inch brass tubes, Waddington and other bodies are not very heavy, wing length up to 8 cm. The very beginning of the summer, the water is still high and cold, but becomes brighter and the level falls. First weeks of June. The same deep places , large depth, bottom fishing by fast sinking line at the main stream, under rapids holes , deep plum. Flies - 0.75-1.5 inch copper tubes, Waddington and other major carriers, wing length up to 8 cm. Bright enough, wing - combination of red, yellow, green, blue, black with bright elements on the body flies. Slow, not a very deep pools, clamps along the river, small holes, fishing near the bottom, sinking line. Flies 0.75-1-inch brass tube, Waddington and others not the heavy carriers and single hooks № 2-4, wing length up to 6 cm. Deep places near the main stream, large depth, under rapids holes , deep plum, means bottom fishing by fast sinking line. Flies 0.5-1-inch brass tube, Waddington and others carriers, double and single hooks № 2-4-6, wing length 5 cm. Flies 0.5-0.75 inch brass or aluminum tubes and other light carriers, single and double hooks № 4-6, wing length and 5 cm .Wing dark, bright elements on the body flies. July salmon fishing. Strelna river.